The Istanbul Chamber of Industry's (ICI) ordinary Assembly meeting for October was held on October 25, 2017 in Odakule with the main title of “An Outlook on Economy and World from a Historical Perspective”. 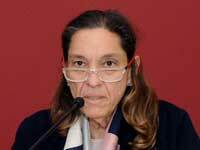 The host was Prof. İlber Ortaylı at the Assembly meeting chaired by Zeynep Bodur Okyay, ICI President of Assembly. Taking the floor from ICI Chairman Erdal Bahçıvan, Prof. İlber Ortaylı made intriguing comments on the history of the Turkish industry: “It is not true that Ankara was a poor small town before becoming the capital. It used to have a rich mercantile class back then, and the region including Kayseri enjoyed significant wealth from commerce. It is high time to voice the production and trade potential of Ankara and Kayseri in this region”. 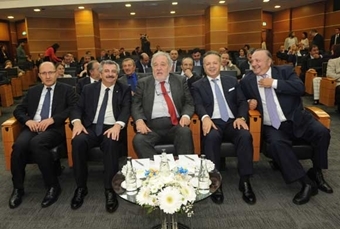 Prof. İlber Ortaylı also answered ICI Assembly Members' questions concerning their expectations and prospective outlook, saying that the future was unpredictable to all and no one could guess what would happen, but could infer would not happen by looking at the present, and he referred to education. Ortaylı stated that none of our prospective ideals and goals could be achieved with our current education system, highlighting good and quality education as the only way to fulfilling these ideals and goals. “Moreover, education is the fastest responding field among our current issues. If we adopt a robust education system today, we would reap the rewards in ten years at the maximum. 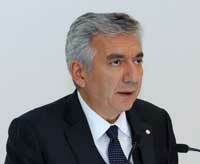 The only way for us to join the global top 10 economies is to take education to the highest level,” stressed Ortaylı. “To make headway towards big goals and achieve great success, societies take heart from their past. And we are a country that has ruled across a wide region, and one with rooted state traditions and a long-established history of arts. It can be said that we, as a society, are presently drawing strength from our history. We want to become one of the world's top 10 economies. We cannot reach there without a strong sense of history. History is also a source of lessons for us to learn from. A strong sense of history is necessary not only to avoid the past mistakes but also to succeed as a world-class economy. Looking at the countries that managed to build global brands such as the United Kingdom, Italy, France, Spain and China, for that matter, we can observe that they are all able to pass on the splendor and the refined tastes of their history to their products. We too have a splendid history and a strong tradition of arts. The question we need to ask ourselves is whether we take inspiration from this history sufficiently. We all know that throughout the recorded history, dozens of empires, which once ruled the world, fell apart as they failed to keep up with the times or come through civil strives. The history demonstrates that pioneers of novelties always grow stronger and expand their sphere of influence. Spain stood out and prospered from discoveries, Italy from the Renaissance, China from inventions, the United Kingdom from the Industrial Revolution, and today, Germany from its new industrialization we call industry 4.0. Concluding her speech, Zeynep Bodur Okyay, ICI President of Assembly, invited ICI Chairman Erdal Bahçıvan to the floor for his address on the agenda. Bahçıvan stated that in this era marked by a faster pace, it was not easy at all to appreciate the developments in the world and in the economy. Noting that prediction has become more difficult than ever, Bahçıvan added that they are in great need of taking the current conditions with calmness and common sense. Describing the historical perspective as vital for making healthy and accurate predictions, Bahçıvan said that we need to look into what triggered today's world of uncertainty and pessimism. Bahçıvan pointed out that wealth as an ideal moved away from the real economy, production and hard work for a world praising virtual wealth, informing that the total volume of finance markets worldwide has grown ten times larger than the real economy and the industry lost its share in the world revenue along with the rise of an economy based on virtual wealth. This unhealthy situation caused a global boom in inequalities, to an extent unprecedented over the last 20 years, reminded Bahçıvan, and referred to the World Bank data showing around 800 million people today trying to survive on less than 2 dollars a day. Stressing that maintaining economic growth gradually becomes more difficult amid the rising rates of youth unemployment, Bahçıvan said that social intolerance gains visibility in the emerged and emerging economies alike. As the effects of the 2008 financial crisis continue to shape the world economy, an uncertainty governs the political arena, indicated Bahçıvan, adding that instability, disorder and uncertainty make it harder to comprehend the world's general situation, and more and more concerns are raised over the prospect of a global conflict and a third world war. Bahçıvan noted that the world was once based on economy but is now concentrated on safety. Pointing out that the current understanding of globalization falls short of solving the most severe crises such as civil war, hunger, poverty, and famine; Bahçıvan said that those unable to benefit from globalization support protective policies and those looking for someone to blame for the socioeconomic problems resort to populist opinions. Following Bahçıvan, Prof. İlber Ortaylı, Faculty Member at Galatasaray University, took the floor to address the Assembly members. Ortaylı noted that the Ottoman Empire was an industrialist country of its era, in the 15th and 16th centuries, with a particularly well-developed carpet weaving industry. Stating that the Ottoman Empire had a primarily military character like other empires, Ortaylı explained that flag officers and timariots were wealthier than merchants. Ortaylı rejected the view that Ankara was unimportant before becoming the capital, and claimed that it housed a rich mercantile class back then, and the region including Kayseri enjoyed significant wealth from commerce. Ortaylı stressed it was high time to voice the production and trade potential of Anatolia, Ankara, and Kayseri in this region. Some periods of the economic history should be properly reviewed, according to Ortaylı who explained that the privilege granted to the United Kingdom in the 19th century had positive effects on many areas, contributing to the prosperity of Syria and Lebanon, and the development of Safranbolu and Izmir. Ortaylı remarked that the global economy was in good shape, and massive bankruptcies were very rare before the World War I, but the post-war era was marked by significant shifts in economic balances, further exacerbated by the irrevocable human casualties. He told that the Turkish industry and manufacturing were above the world average before World War I, but were brought to ruin as a result of the conflict. Ortaylı said that conventional industry and modern industry led to different social conditions, more specifically well-educated literates were not in demand in the former system, whereas the new order needed more bureaucrats and a wider educated crowd hence the schooling efforts. The new industrial era required the transition to a new financial, taxation and legal system, noted Ortaylı, adding that Turkey underwent this transformation. Pointing out that the political power should be regarded as an independent variable, Ortaylı illustrated a government's power to impose through examples from Nazi Germany and Mussolini's Italy. Ortaylı designated the industrialist as an independent variable, as well, since not every word of industrialists is automatically accepted, nor they must automatically agree with everything told to them. Turkey must properly avail of its raw material resources to be able to become one of the top 10 industrialist economies, and family companies have a culturally pivotal role in the Turkish industry, noted Ortaylı. He stated that Turkey started in the early 50s to compensate from the past human losses in the industry, mentioning the importance of professional associations such as Istanbul Chamber of Industry. Ortaylı said that professional associations must serve as the places for legislation drafting and planning, especially informing the government, even causing inconvenience to the government. He added that, if this was not the case, the western industry model could not be applied in this country. 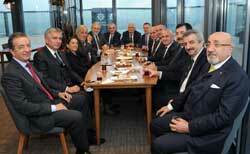 ICI Assembly Members taking the stage next shared their views on the main agenda item and posed questions to Ortaylı.